First autonomous only trucks for Brazilian mine. Vale will have the first mine operating only with autonomous trucks in Brazil. 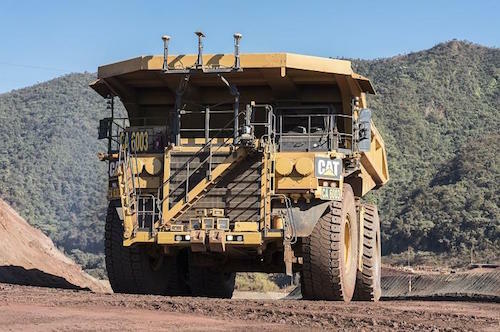 Seven haul trucks already run autonomously without operators. By 2019 there will be 13 of them. ​Huge haul trucks, with a capacity of 240 tons, circulate on the roads of a large mining area without operators in the cabins. Controlled only by computer systems, GPS, radars and artificial intelligence, the vehicles move efficiently between the mining front and the unloading area. What sounds like a futuristic film is the reality that begins to appear in the Brucutu mine owned by Vale in Minas Gerais. The result of six years of research and testing, seven trucks used to transport iron ore from the mining front to the processing plant began to be part of the daily operations alongside six other traditionally operated vehicles. When the entire fleet is replaced by trucks with the new technology, in early 2019, Brucutu will be the first mine to operate autonomously in Brazil. Compared to the conventional transportation model, the autonomous operations system has a higher productivity. The productivity of haul trucks has significant gains. Autonomous operation also increases the life of the equipment, leads to less wear of parts and reduced maintenance costs. Based on technological market data, Vale expects to obtain an increase of around 15% in the equipments lifespan. Fuel consumption and maintenance costs are expected to decrease 10% and the average speed of trucks are expected to increase. The autonomous operation also brings relevant environmental benefits. The economy of fuel used in the machines results in lower volume of CO2 and particulate emissions. "The use of this type of technology is increasing in the world market, not only in the mining area. The use of autonomous equipment will bring gains in productivity and competitiveness for Vale and the Brazilian industry", says Lúcio Cavalli, Ferrous Planning and Development Director. People continue to play an important role in autonomous operation. The teams that supervise the entire process can be comfortably installed kilometers away from the operations. Brucutu's equipment operators were moved to other functions in the mine itself or other Vale units in the region. Part of the team was used in the management and control of autonomous equipment, after having undergone training courses, which can last up to two years. With greater use of autonomous equipment Vale is likely to create more opportunities for highly qualified professionals in the technical and engineering areas of automation, robotics and Information technology in the operational areas. With less people present in mining activities, where there is movement of heavy vehicles and large volumes of cargo, the employees' exposure to accident risks is reduced. The technology used in the trucks can identify obstacles and changes that were not foreseen in the path determined by the control center. Upon detecting any risks, the equipment will shut down until the path is cleared again. The safety system is able to detect both larger objects such as large rocks and other trucks and also any people that are in the vicinity of the road. The experience with autonomous equipment in Brucutu will help Vale to determine the future of the use of technology in other operations. Conversion from a mine to an autonomous operation requires significant investment, so mines with a low production volume would continue to use the traditional system. "We will carefully evaluate the results and feasibility for other operations and processes, but the prospects are promising", says Lúcio Cavalli. Vale began implementing a digital transformation program in 2016 to adapt itself to Industry 4.0, which will allow the company to promote the integration between the business areas around the world, reduce costs, simplify processes, increase productivity and operational efficiency, and achieve the highest levels of health and safety. The program is based on four pillars: Analytics, integrated systems and chains, robotization and autonomous equipment. The company is using Internet of Things, Advanced Analytics, Machine Learning, Artificial Intelligence and mobile applications, among other technological innovations. Vale is a global mining company that has the mission to transform natural resources into prosperity and sustainable development. World leader in iron ore and nickel production, Vale is headquartered in Rio de Janeiro, Brazil, and is present in five continents. It operates integrated logistics systems, with about 2,000 km of railways, maritime terminals and 10 ports in Brazil, Indonesia, Malaysia and Oman. Committed to the highest levels of governance, Vale supports 52 social and cultural projects in 65 Brazilian municipalities, through the Vale Foundation, and protects or helps to protect 8,500 km2 of native areas in the country.